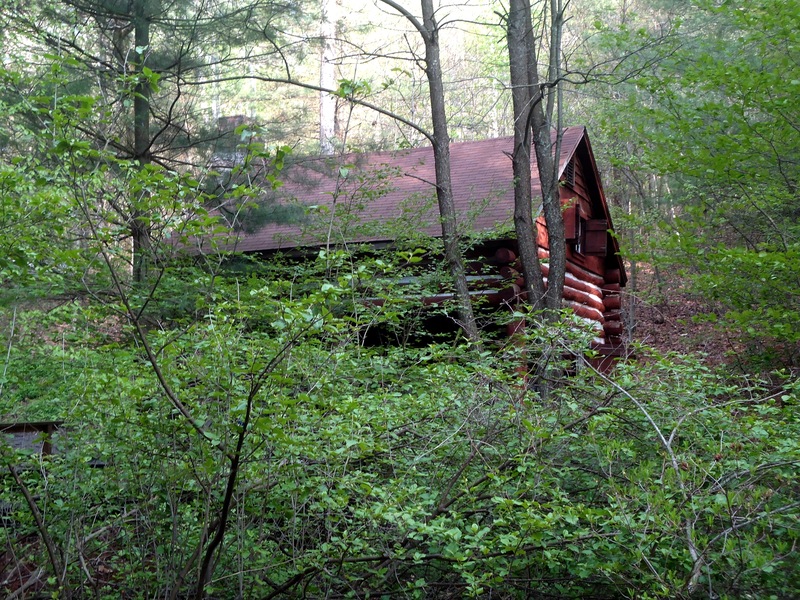 Trail Dames Maryland had rented Milesburn cabin, a PATC cabin, in Michaux State Forest for the weekend. I had signed on for Friday and Saturday with planned hikes on the AT each day. So north on 15, west on 34…oh did I mention it rained for a day and night before I headed up this way? Yeah, ten minutes after getting on 34 the road was flooded out, completely impassable. Had to turn around and find another route to Pine Grove. By the time I got to the park, I was itching to get out of the car. Pulling up to the Pine Grove Furnace store, home of the “half gallon challenge” for thru hikers, I see Dirigo, Python, Tenacious D, B^2 and Google waiting for me. There was the initial flurry of confusion, running to the AT museum to use the bathroom, finding out the AT is under water near the lake…then we were on the road again…shuttling up to Rt. 94 to begin our hike back to Pine Grove Furnace (PGF). Water was the main course of the day, but Google & I did as much of the section as possible starting at Sheet Iron Roof Road south to Pole Steeple (2.8 miles short of the AT Museum at Pine Grove Furnace SP). We ran into a thru hiker named “Harlan” along the way and at just the right time. Google and I had already had one small stream crossing, when we were faced with a much bigger, much faster, much deeper stream. Well, we had just about decided to wade across (in our bare feet) when Harlan and his buddy came along. Harlan had just made it across the stream getting a little wet and decided a bridge needed to be built. He was like a superhero! Gawd, the logs this guy was picking up and hauling into the stream were gargantuan! We appreciated his contribution to our cause! Who doesn’t like RR crossings?! Thru Hiker “Harlan” building a bridge. After we crossed, Harlan decided the bridge still wasn’t sturdy enough. So he added another log! Thankfully, the next water crossing had a bridge! The AT! A little sloppy today! The view from Pole Steeple…not so sad we had to come this way! Another view from Pole Steeple. Gorgeous day after the rain. Saturday’s hike was from Sheet Iron Roof Road to Boiling Springs. This hike took us through a really cool rock jumble and then entered farm fields before cutting back into Boiling Springs. Another fabulous weather day and we felt so good once we got to Boiling Springs that Google, Bag Lady, L and I decided to do 4 more miles to Trindle Road. This would make the first day of my back pack with Google the following weekend 4 miles shorter…yay! The terrain through the Cumberland Valley is easy walking and just gorgeous. I wouldn’t want to be out here on a hot summer day, but on this cool, breezy sunny day…oh, just perfect! Trail Dames on the trail! Do we get royalties for this? The beginning of “PAhoosic Notch”! Jumble, jumble! I love big rocks. It’s a maze. Totally cool! A stop at Alec Kennedy Shelter for lunch. Dirigo meets up with an old friend. En d of a great hike! This entry was posted in AT-Pennsylvania, Uncategorized and tagged alec kennedy shelter, Appalachian Trail, Appalachian Trail Pennsylvania, Boiling Springs Pennsylvania, hiking near Gettysburg, hiking Pennsylvania, Michaux State Forest, Milesburn Cabin, outdoors Pennsylvania, Pine Grove Furnace State Park, section hiking, trail dames, walking, womens hiking groups near Frederick Maryland.